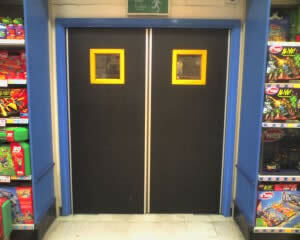 Doors and walls are a vulnerable part of any building. Especially in a busy environment such as a store where goods and people are continually moving from storerooms to the shop floor, and doors are constantly being damaged by the movement of trolleys and equipment. Doors and doorframes need significantly less repair, replacement or re-decoration with the use of Intastop’s door and wall protection products.